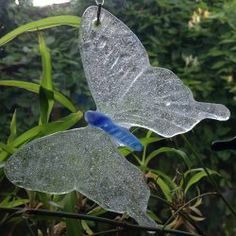 I make ornaments to decorate the garden (well you can hang them anywhere you like of course !) and primarily glass ornaments. The photo above shows my bay tree which is full of them (and bird feeders and bird houses !). The One and Only Original ! I am a very small, fledgling (but proud !) business and at the moment, my photographs are taken by me via my SmartPhone so some are a bit better than others ! My favourite colour is blue, just in case you haven’t already noticed ! Although I’m very fond of cranberry/raspberry/crimson/dark pink too ! Please browse via the Shop link above to see my current range (and what is available !). Find out more about me by clicking About…..